NOTE: I recently updated this script for XenApp 7.x environments. Note: I wrote this script for a XenApp 5.0 environment with PowerShell 2.0 and CTP3 XenApp Cmdlets. $objctxsrv | Add-Member -type NoteProperty -name LEName -value "OFFLINE"
#$objctxsrv | Add-Member -type NoteProperty -name Load -value "0"
#$objctxsrv | Add-Member -type NoteProperty -name Active -value "0"
#$objctxsrv | Add-Member -type NoteProperty -name Disconnected -value "0"
Subject = "Report: Server Load and Assigned LE for XenApp Farm"
I created a repeating scheduled task on a XenApp server in the farm I wanted to report on. Now my team gets an hourly report of the farm load. As always, I welcome all comments and questions. Any update on making this work with XenApp 6.5? None yet. Have you reviewed the comments for this post. I believe someone has made it work for XenApp 6.5. We have a Very complex environment that we use this script for. 14 seperate farms, 12 domains spanning several several geographical regions which is currently a mix of 4.5, 6.0, 6.5 (slow process of migrating to 6.5) – a total of 127 citrix/xenapp servers. – Powershell restriction policy set to allow the running of the script as a task. 2. logon as service rights. Again, Big thanks to Alain to getting this started. 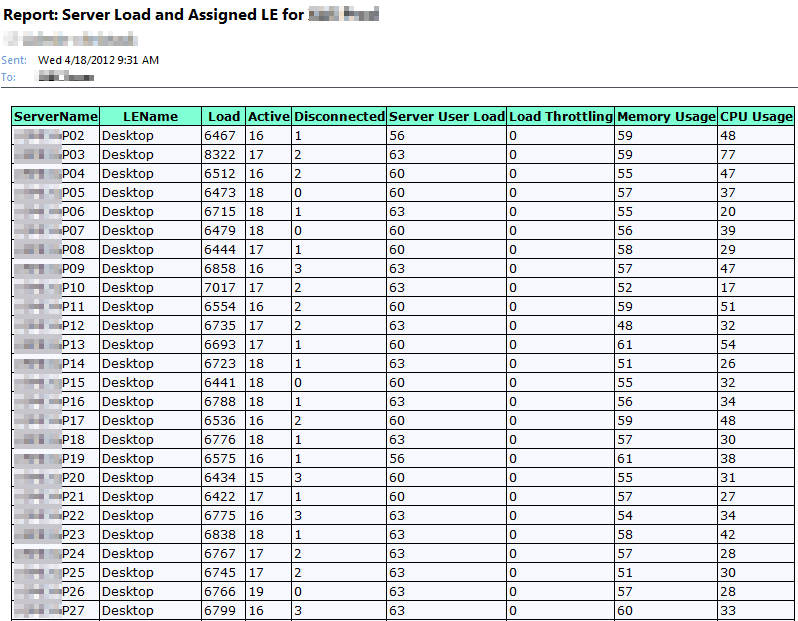 I got this working on Citrix 6.5 complete with load evaluator name and Load evaluator rule values for each server. It does not require any customization for different load evaluators with different rules either. The downside is it is not pure pure Powershell and has a dependency on an external exe from Citrix called queryds.exe. Did you ever get a copy of this? I will try to find a way to make my modifications to this script available. At this point it works on 4.5 and 6.5 maybe others and reports the Load Evaluator rule values. The one downside is it does require DSQuery.exe. I have added a host of other enhancements like there is no need to customize the script to work with different load evaluators as well as additional features, for instance, I currently run this script via a scheduled job every 15 minutes if the clock minutes value is less than 15 it will send an email otherwise it just appends to a running log file. The result is I get a report emailed every hour AND I can get a running history for every server in my environment that shows load every 15 minutes with why the load is what it is. Plus more but i don’t have the script in front of me right now to list it all. “I am not sure what you mean by ‘missing the load evaluator rules’. With the line: $srvle = Get-XALoadEvaluator -ServerName $ctxsrv | select -Property LoadEvaluatorName I am setting the $srvle variable to be the name of the Load Evaluator currently applied to the server being evaluated ($ctxsrv). As long as all of the farms (4.5, 6.0, 6.5) have the most recent version of citrix/xenapp powershell cmdlets applied, this has always been returned in readable text. Does not work with 6.5 due to differences in output from get-xaserverload. Only server and load are returned. Neither the LE Name nor the rule values are returned. I have one script for all farm versions and it is working pretty well returning all the names. In fact i have just recently added listing of workgroups (if 4.5 it just states ‘No Workgroups’) which is also returning if a server is a member of mulitple workgroups. Thanks Alan for getting the ground work laid. That is sweet. Do you have a link or blog post detailing what you did? I’d love to share it here. 2. Logons enabled change found in responses here – Thanks very cool idea! 3. CSV Output with Date/time as the first column because I wanted to use this to illustrate load trends using CSV output that appends to a CSV file indefinitely. 4. A condition to send the email based on time. This way I can run the script every 15 minutes to get trending data in the CSV file but it will only send an email with the current runs data in the body once every hour. 5. Zipping and attaching the csv data file to the email as an attachment. This way the email shows me what load looks like right now but I can also open the zipped CSV file and see how usage has been trending in 15 minute increments, or however often I choose to run it, for the duration of the CSV file by loading it into Excel and sorting first by server name then by date/time columns. One of the modifications i made was to determine if the system had logons disabled (something you don’t get from QFARM /load) and to show up red when they were disabled. 1. i ended up removing the $head $Title, i could not get the .replace to work correctly with it. 2. when i attempted to pipe this to a file i was not able to eliminate the < and > but it worked for the e-mail. I have not tried this with any of the other options but it might work. ok. the $LES = “False” had HTML <font code in it that got converted when it posted. but inside the " " it was standard html code to turn it bold and color to = red. then word False and closing the html brackets. Great stuff. I will try your modifications too. If Use the send message stuff should I put the cassarray from Exchange 2010 server. I get also the error for that. If somebody have a solution I will wait for your help. No I haven’t been able to try this script with XA 6.0 yet. I hope to try it with 6.5 in the near future. Were you able to test this on XA 6.5? I have the same issue on XA 6.5. Let me know if you find a solution for this. Not yet :). Hopefully I’ll be starting a new XenApp 6.5 farm soon. if it doesn’t work check to see if you have the current version of the Citrix SDK for the cmdlets on all versions you want to run this against. I am able to run the first command, however the Get-XALoadEvaluator fails with the Cannot validate argument on parameter ‘Servername. I have downloaded all the SDK’s. Any suggestions would be appreciated. I’m in a 6.5 environment. That should work (without the quotation marks) on both 6.0 and 6.5. I just wanted to say I am now using this script and its great! Good work. That’s terrific. I hope it helps. When i run it from one of my servers i get the following error several times – i get the report through email, but its missing several fields. A friend said its something wrong in the $srvload.Rules array. What version of XenApp and PowerShell are installed on your servers? This script runs from a zone data collector running XenApp 5.0 on W2K8 and powershell 2.0. I’ve got version CTP3 of the XenApp Cmdlets installed which are still considered (by Citrix) a technical preview. Also, what are your LE rules? Ah! Well that might explain it then. I (not sure why…) just assumed this was for XenApp 6.5. Were running 6.5 and Powershell 2.0. My LE Rules are pretty basic at the moment; the production one im using was just the user limit one; however i loaded up a more detailed LE that tracked CPU Usage, Memory, etc to see if that was the issue and it still threw that error. Doing a bit of google work, the CTP3 Cmdlets appear to be more geared towards 5.0; while the Powershell SDK CmdLets are what im using in 6.5. The purpose of the script to to show load/utilization per server, so removing duplicates would get you a user count per server, but not show the session load. You have all the sessions in the $ctxsrvSessions array, so you could run a further command to find the users with multiple sessions in that array. 2. Use the get-unique cmdlet but you would have to sort the array first. I’m curious why a user would have so many multiple sessions open. Do you have a lot of server silos in your environment? I’ve tried to sort the array like that, but received mixed results. I’ll try it again today at work and report back. Thanks. The reason why we have so many sessions is because we don’t host a full desktop, and instead just host separate applications. When a user logs into the web interface and launches an application(Like explorer, for example), he can launch it as many times as he wants, and each one of those counts as a session in the script. At first we thought it was doing unique users, but saw that one of the servers was reporting 37 active sessions. It turned out that one user was (for reasons unknown to us) using 14 explorer windows. When looking at the Active Sessions list for the 20 servers in our environment all of them had about 20 active sessions with the exception of this one server reporting nearly twice as much- some people looking at the report were concerned there was something wrong with the server.